Rights group asks Bangladesh not to turn away refugees, and slams Aung San Suu Kyi's 'unacceptable response' to crisis. Bangladesh has detained and forcibly returned at least 90 Muslim Rohingya refugees back to Myanmar, as thousands of civilians from the ethnic minority area, on the other side of the border, attempt to escape from continuing violence that has killed scores of people. At least 20 Rohingya were caught on Sunday and sent back after crossing the Naf river, a natural border between Myanmar and Bangladesh, Ariful Islam, a commander with Border Guard Bangladesh (BGB), told AFP news agency. Separately, a group of 70 Rohingya were also sent back by police late on Saturday, after they crossed the "zero line" border zone, where Myanmar soldiers earlier fired mortars and machine guns at Rohingya villagers, making the dangerous dash from Myanmar's northern state of Rakhine. 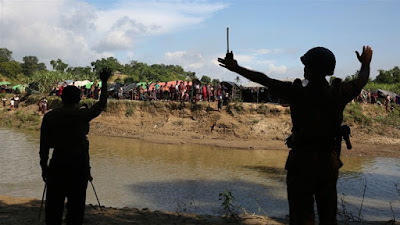 The villagers were caught roughly four kilometres inside Bangladeshi territory, en route to a refugee camp in Kutupalong, where thousands of Rohingya already live in squalid conditions, said local police chief Abul Khaer. "All 70 were detained and later pushed back to Myanmar by the border guards," Khaer told AFP. "They were pleading with us not to send them back to Myanmar," another police officer said on condition of anonymity. In its latest report on Sunday, the office of State Counsellor Aung San Suu Kyi, said the death toll from the clashes between security forces and Rohingya rebels that started on Thursday has reached 96 - mostly alleged Rohingya attackers but also 12 security personnel. Myanmar's government has accused armed men from the Arakan Rohingya Salvation Army (ARSA) of carrying out the deadly attack on police outposts, which sparked the latest violence. Local Rohingya activists have reported higher death toll, but Al Jazeera could not independently confirm the figures. Since the violence erupted, thousands of Rohingya have fled towards Bangladesh, but authorities there have refused to let most of them. 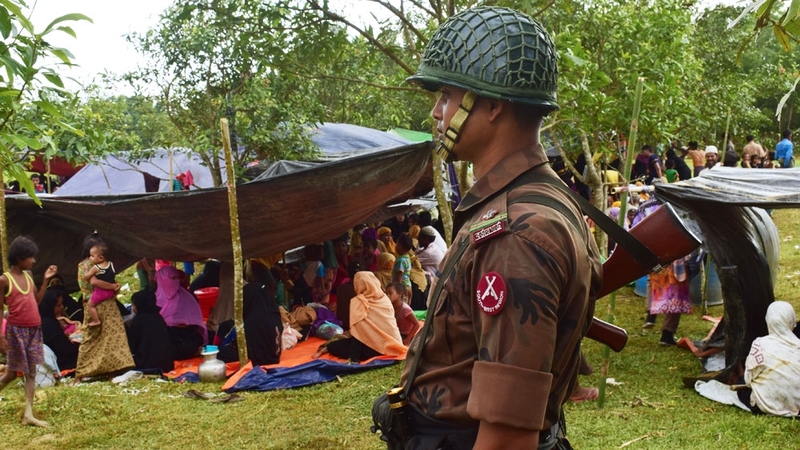 Al Jazeera's Tanvir Chowdhury, reporting from the Bangladesh side of the border, said hundreds are stranded in at least two temporary camps set up by Bangladesh police. "The situation is very dire, and it has taken a new dimension because there is a small-scale insurgency within the Rohingya community in the Myanmar side. "For Bangladesh, it is a major challenge," he said, pointing that there are already an estimated half a million Rohingya in the country. In an interview with Al Jazeera, Matthew Smith of Fortify Rights, a human rights monitor in Myanmar, described the Rohingya situation as "completely unacceptable" and called on the international community to take an "urgent humanitarian assistance" on both sides of the border. He said the military attacks carried out by Myanmar troops were indiscriminate. "We are consistently getting reports of army attacks on civilian populations, burning villages down, killing men, women and children, and this is leading people to flee for their lives." One video posted on social media showed hundreds of Rohingya, drenched in the rain, clambering up and down a muddy hill while trying to cross a creek. Smith urged Bangladesh not to turn Rohingya away, saying its government has an "obligation to give at least temporary protection to refugees ... running through forests, fleeing for their lives, in most cases with only the clothes on their back". He also criticised Myanmar's Suu Kyi "for waging a very dangerous propaganda campaign" against humanitarian workers helping the Rohingya. "She's been shockingly irresponsible with this crisis," he said. "The international community needs to speak loudly, clearly and with a singular voice that this is completely unacceptable, and her government needs to change course." Suu Kyi has called Thursday's attacks "a calculated attempt to undermine the efforts of those seeking to build peace and harmony in Rakhine state."